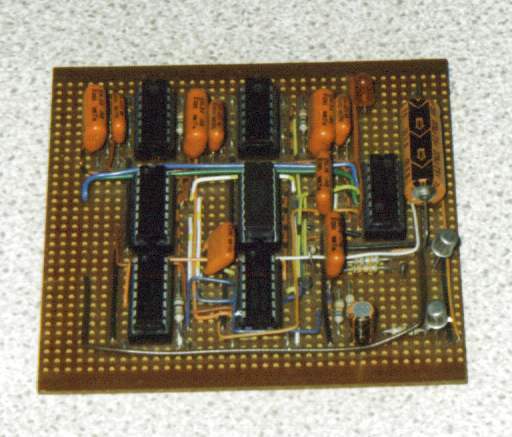 Unfortunately, this board was part of a much larger project containing multiple power supplies. One day whilst working on another circuit , I slipped with a wire and splashed 24volts DC onto this board. There was a small spark, and puff of smoke before all this chips were cooked! If anyone does consider building such a circuit, then my advice would be to stop and look in your local electronic parts catalogue. There are now dedicated combination lock IC's with combinations many times greater than this circuit. Incidentally the number of combinations offered here is 10 x 10 x 10 x 10 x 9 = 90,000. Check out Dean White's Electronic Gadgets, on the Electronic Sites Alliance web ring, he also has a combination lock circuit.